Remember the other day when I soared like an eagle and wrote all those letters? This was the pile of letters to a bunch of people from Leonard Pennario's address book whom I have not talked with yet. I am trying to knock them all off. Yesterday I had to take them to the post office. Was that ever a trip! 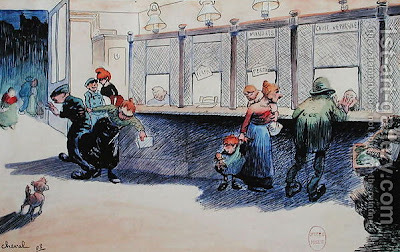 Above is a picture called "Post Office Counter, 1908" by Joseph Ferdinand Cheval. He was a postman! The post office looks like a zoo in that picture but I will tell you this: Those were more civilized days! In our time the post offices are always in the neighborhoods where slugs and schufts live. Remember how we started using the word schuft? I was thinking about that while I was standing in line. And something worse is going on now. Evil is afoot in the post office and every time you walk in you wind up in some kind of a situation. That is what happened to me yesterday at the post office on Hertel near Elmwood. First there are these young schufts kind of lounging with cell phones where the line forms. I asked if they were in line. No, they weren't. So I went to the head of what would be the line, and stood there. That was good, anyway, that no one was in front of me. But it is a bad sign when you have to ask people if they are in line because they are just lounging there. Then I hear "Next." And I step forward. But ... who was calling me? It was a man's voice, but the one man on duty was preoccupied with another customer. So I'm hovering, and then I see that he is arguing with this other customer. "There's nothing more I can do for you," he is saying. "Unless you want me to go in the back." God forbid he would go in the back! I could not figure that out. The angry customer wants the guy's last name and he wants the name of the manager of the post office. The post office guy is ignoring him and he looks at me. Which is when I see the situation: He is using me to get at this other customer. He wants to ignore this other customer and take care of me instead. Which, I just want to get my letters mailed, so I play along. "Here," I said. "I just want these going first class, and there are a couple in Europe, and --"
"I want to see the manager," the angry customer cut in. "I told you," the clerk says. "I would have to go in the back. There's nothing more I can do for you." Then he turned and left! Perhaps he was actually going into the back. So now I am stuck here in post office limbo. Meanwhile another clerk calls out: "Next!" And a customer behind me in line walks over to her. Ahead of me! I am this big loser. I stood there with the angry customer, who is now yelling angry things at someone else. Now I am getting nervous. I have heard what happens in post offices, I am thinking. I am going to get shot! Well, I thought, next other booth that opens up, I will cut and go over there and explain the situation. But no other booth opened up. Finally another clerk freed herself up and began dealing patiently with the angry customer. Then the schuft clerk came out of the back room and asked me crabbily what I wanted. No "I'm sorry you had to deal with all that." And not only that, but they had no nice big stamps. Commemoratives, to use the correct term, which, being a former stamp collector, I may. I am so naive. I had thought maybe they would have nice stamps of a musician or dancer or actor or someone I could stick on my Pennario letters to impress his friends. "Those aren't in yet," the guy told me. Again, no apology. So I am stuck with these little square Purple Heart stamps which were the best I could do. You cannot stick a picture of Homer Simpson on a letter to Jacqueline Piatigorsky, you know? Jacqueline Piatigorsky is the widow of Pennario's close friend Gregor Piatigorsky, the cellist. She is 97 and she is one of the Rothschilds, the great banking family, and I have to approach her in the right way. What are we even doing with stamps of the Simpsons, anyway? I mean, I love the show, but when it comes to honoring people with stamps, how did the Simpsons get to the front of the line? Why are they a priority? 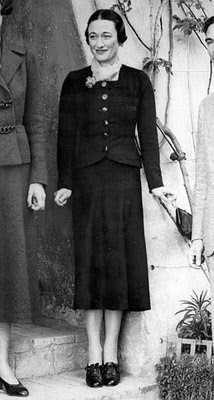 What about Wallis Warfield Simpson? I would rather see a stamp of her. Where was I? My post office adventure. I am almost at the end of the rant but there is one more thing. This guy, this clerk, he could not even stick the stamps on my envelopes right! I knew better than to trust him to do that. But there were two letters in this batch going to Europe so I made the mistake of saying, "These can just go." Because I knew it would be complicated, figuring out which stamps to use. These days I cannot even figure out simple one-ounce first class. So he gets these stamps. And he picks up this envelope and he sticks the stamps on so sloppily that one of them is even partway off the envelope. This is a letter to Michel Legrand. What is he going to think? The other letter was not much better. The clerk overlapped the stamps, that was how sloppily he stuck them on there. In my shock I did not notice who that letter was going to. It might have been Vladimir Ashkenazy. Unless Ashkenazy is in the pile yet to go out. I am hoping he is. I am afraid to look. It is pathetic, the idea of me going to the post office at Hertel and Elmwood and trying to mail letters to songwriters and Rothschilds and, well, you would not believe the other people in this pile of letters. That is only two of them. I should know better than to try to mail letters to these distinguished people from my stupid neighborhood post office. As we like to say in Buffalo, you cannot get there from here! Hopefully, you bought a bunch of 'Forever' stamps whilst you were there anyway! Larry, I did buy the Forever stamps! And I thought of you! Now you have me laughing too. Under my real name I wrote my say about the post office several weeks back in Everybody's Column in the paper you work for. Morale there is at rock bottom and I see no solution. As a former employee, I'll offer the apology it's stupid bureaucratic culture is unwilling to. The word schuft could acquire a legitimate English definition as follows: "Noun: Policies developed and implemented in the US Postal Service". At least you didn't have a couple in front of you getting passports from the lone counter person. The very polite, very very thorough counter person. I understand why morale is poor, but it's not my fault! Honestly I wanted the head of the manager (who was hiding in a back room)on a platter. Probably not their fault either. Instead I smiled and said thank you when it was my turn 25 minutes later. At least they had a counter to sit on. Next time try the post office on Grant and Bird. They're very friendly there. Really, I'm telling the truth, I swear! To Becky, hoping you read this: I'm a retired carrier and my heart bleeds for all of those who have to face the public. The overpaid bloated managment is at fault and the brutal madness from headquarters finally drove me out in January. I took serving the public seriously and paid a heavy price for it. Prof G - I'm really not mad at the workers themselves, that's why I was able to stay calm (I tend towards impatient naturally). I have read some quotes by head honchos and realize it must be tough working for them. I wasn't being sarcastic (really) when I said the people are very polite and thorough. They are. That helps calm people down too. That said, I spent my time wondering if my mom would be agreeable to fedex or something (her mail; I would have thrown regular stamps on my stuff 20 minutes earlier). Wow, I will have to check out that fabled post office at Grant and Bird! On Saturday nights on channel 17 they are showing a series - Larksrise to Candleford. It is a charming adaptation of a book with the same title. It is the story of the goings-on in a English village post office in the very last years of Queen Victoria's reign. The people are much more genteel than the thugs you ran into. Your life is full of adventure. Kinda like Lucy. . . . who is Ethal? Love your work. No wonder nobody uses "snail" mail anymore.